Subject: Your Monster "cup" - What do you REALLY use? Right now I am using an old dingy felt dice bag that is the same color purple as the Mythos cards so color theme it fits. Yesterday I saw a black container in my cupboard (a dietary supplement powder) that's almost all used up, it's about 16.5 cm high and 10.2 cm diameter, it's ideal, for me, to use as a monster cup and its cylindrical rather than conical shaped so monsters shouldn't get trapped at the bottom. 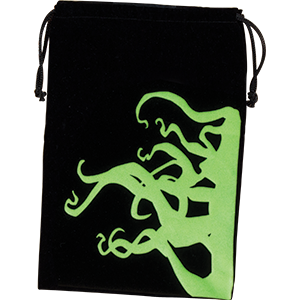 I used to use the old Crown Royal bag, but I upgraded to some nice custom Artscow bags for monsters and clues. A black bag that I had spare. The one that has me pull 6 Cultists in a row even though I SWEAR I mixed up the bag!!!!! Ah, you dished out for the special cursed edition. Didn't have the extra sanity to spare at time of purchase, so I only got the standard one. I use this as well! The (very confused and confusing) German printing of Tempus had for some reason or other (or perhaps no reason at all) a black bag included. It's the monster cup now. Clues and gates just get shuffled on the table facedown and picked whenever needed. I have this one also. For some reason, it reminds me of Dr. Zoidberg, though. I have only recently switched to a Crown Royal bag to save space. For the longest time I used a plastic Halloween witch's cauldron decoration which worked quite well. I use the cloth bag from Carcassonne: Expansion 2 – Traders & Builders. It works incredibly well. Dunno, that sounds like the blessed version to me. My monster bowl just spits out the Star-spawn and Dhole every single time. I'll take cultists any day. I know it's ridiculous but I stack the monsters in piles of ten and use a random number generator to pick one randomly from the piles (eg pick monster number 42 out of the stacks). Totally nerdy but I think it's more likely to give more purely random results then shuffling in a bag. Call me boring, but I use the Strange Remnants box (minus the inserts, of course). It makes it easy to store; just put the lid back on. A bag made from human skin.